In 1883 the Sandy Point Shoal caisson with a 37-foot Empire-style eight-sided, red brick tower with a white roof and black lantern housing a 4th order Fresnel lens was built. This caisson replaced an earlier Sandy Point Light that had been built on land where Sandy Point State Park is located now. It was an on shore brick tower constructed in 1858 that was situated in a poor location. 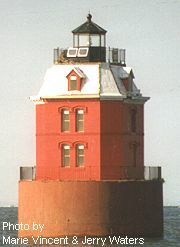 Sandy Point Shoal Light has a wooden caisson foundation supporting a round 35-foot-diameter cement-filled cast-iron cylinder on which a 2 1/2-story octagonal brick structure rests. The structure is 24 by 24 feet with truncated corners giving it an octagonal shape. Although not originally painted, the brick portion of the structure is now painted red. The wooden third story mansard roof is painted white, the lantern is painted black, and the gallery deck is painted a dark red/brown. The first two stories were used as living quarters, the third level as the watch room, and the lower level within the cast iron cylinder, as a storage area for water, coal, and oil. It was electrified in 1929 and fully automated in 1963. The privy, once located on the southwest side and overhanging the lower gallery deck, was removed sometime since 1989. A pair of davits and a landing ladder once existed on the east side. Another pair of davits and a single loading davit once existed on the west side. The landing ladder on the west side is still used. The lighthouse is situated in 5 to 7 feet of water approximately 1000 yards east from the beach at Sandy Point State Park and approximately 1 1/2 miles north of the Chesapeake Bay Bridge. Because of its location, the lighthouse was open to vandalism and in 1979 the Coast Guard discovered that someone had completely smashed the handmade 19th century crystal Fresnel lens, apparently with a baseball bat. It has been replaced with an acrylic lens. Major restoration work was undertaken by the Coast Guard in the late 1980s and early 1990s. From US Route 50, just west of the Chesapeake Bay Bridge and about 6.7 east of Annapolis, Exit at Interchange 32 and go north on State Route 908 (State Park Road) following the signs to Sandy Point State Park. Turn right onto South Beach Road, still following the signs for the park and go 0.9 miles to the parking lot at the end of the road. The lighthouse is located about 3,000 feet east of the beach in the Chesapeake Bay.